The picture of the "door bells" you see there has been in my family since the early 1970's. The bows you see on them aren't original-they were originally done up with fake berries,gaudy paper gold leaves and a couple of pine cones. As much as I loved it,it had really gotten to look shoddy even tho my mom had redone it at some point-the pinecone in the center was her addition. It came off a tree that was in the front yard of a house we rented in the late 70's. I believe the bells were purchased at Stats in the beach area-a very "in" crafts store during that time-sort of like Michaels is now. At any rate-after Yule last year I had purchased the ribbon at Michaels after the holiday with the intention of refurbishing the bells with new bric a brac early this year-I even kept the bells down in my sewing area. Well,this week I finally got to it & added the home made bows with vintage button accents. Glue guns are wonderful! The bells are now hanging on the inside of the front door-hearing them when the door opens & closes brings back a lot of good holiday memories. While I have tossed or donated a lot of the older ornaments to simplify things,I couldn't part with these. The annual Holiday letter is done-I just need to figure how many copies to print & in the cards they go! I really enjoy doing it and wish more people did-it's a great way of catching everyone up on what's been going on in the past year. The hunt is still on for the outdoor holiday lights. The attic really needs to be organized! If all else fails,Big Lots isn't far from here and I'm wanting to convert to LEDs to be more green. Halloween Decor For the Porch! I've had this idea for a couple of years in my head-and I finally did it! I picked up the plastic cauldron candy bowl at a yard sale,got some gorgeous marigolds at a nursery,drilled holes in the cauldron,and viola! A Halloween planter! 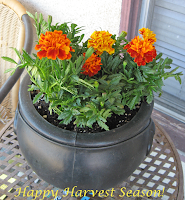 Marigolds are used extensively in celebrating "The Day of the Dead" and the colors on these are just awesome. Ever notice how there's a lack of Halloween songs? For Yule,music a plenty-but for my favorite holiday,there isn't much aside from Bachs Toccata & fugue in D minor. But I will be watching Vincent Price DVDs! I picked up the Better Homes & Gardens Halloween annual (a tradition of mine) and love leafing thru it. I've still got a ways to go on the front porch-hopefully today-seems we have a nice wave of cool cloudy weather and I really want the porch to be nice,neat,and a place that I can sit & pluck mandolin in a comfy chair. Good grief,it's Oct 1 tomorrow and I need to get out the Halloween decor-I celebrate all month long and I'm in disbelief that it's that time already. I always remember my ancestors & friends that have passed over during this time,and I have a few "new" additions to remember this year-a longtime neighbor,a co worker,and one that I used to babysit as a boy and was "extended family" as an adult. This is the only area of life that I don't appreciate getting more of. Michaels crafts stores are selling the most wonderful pumpkin spice candles in a tin for 99 cents! I'll be picking more up next time I stop in. They also have Sugar Cookie & other assorted seasonal scents. I like the metal container as I don't have to worry about accidents & the tins are always handy for something like knitting stitch markers & the like. Long lasting too! I can feel the chill in the air-that wonderful Fall feelin! Was yesterday and while I didn't plan to go,I did anyway. Very festive and family oriented fair-there was some live talent,one woman sang beautifully and played guitar. Lots of crafts,jewelry,clothing,and a couple of country decor stands. While there were lots of lookie loos,very little actual shopping was taking place-seems the economy has yet to pick up for the everyday citizen,including yours truly-tho I did buy a dusty purple beret that had caught my eye when I first started looking about. 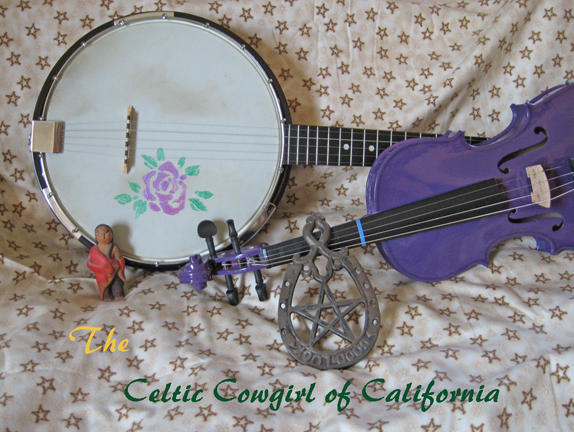 However,it would be fun to do next year-perhaps being a participant for either Mandolin Babes or if I could find other musicians to play with,we could do folkie sets. While guitars were abundant,no mandolins,fiddles,banjos or dulcimers were to be seen. It was beautifully cool overcast weather-towards the end of my visit I found myself drooling over this Mustang! Well I did it-thanks to my sister Farmgirls-I made a skirt from a pair of jeans! Went over huge at my place of work-(where the pic was taken) I'm starting to rip a 2nd pair to make another skirt. Not to mention I started knitting a washcloth using "Sugar & Cream" cotton yarn. Got my teeth cleaned today-good grief my mouth was sore afterward-that chick really seemed to be scraping for all she was worth. Was somewhat drained for the rest of the day. 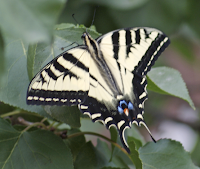 The weather is back to being HOT and I'll be sooo glad for Fall's coolness & slight chill. The yard needs work but it's just too broiling to even think about pulling weeds. So I sit in front of my fan & knit while drinking a cold glass of milk. I received the back issues of MJF and I'm having a ball reading them! (the Simply Bee issue & the Holiday issue '08) I'm amazed at how I've seemed to find where I belong at long last. I very much enjoyed the article "Compassion" in the "Learn to Live" issue. How timely that article was...I had just completed my 1st day of the week at a community college that I work part time at,and It's been made more challenging lately due to a co worker "Ida" (not her real name) who has become a constant complainer and is very into criticizing others for....you name it. It was particularly draining to work around her on Monday as it was busy. Part of the critique was involving yours truly as I'd taken extra time to help a student & Ida was outraged I was doing this because the more time I took with the kid,the more work Ida was having to do! (and she announced it!) Heaven forbid. What made it worse is her voice carries and she was working the window right next to mine,and he heard every grumblin word. While I can normally shrug it off,the negativity Ida was spewing really wore me down-it had an amazing level of toxic-ness to it. What a delight to find the magazines had arrived in the mail when I got home so I could start reading them & shift gears as it were. The Compassion article jumped out at me not so much because of anything I'd done that day,but because it pointed out the negative talk I'd experienced that morning,how widespread it's become in society,and I agree that it's impacting everyone who is in earshot of it. Somehow the Stink bug invasion must be stopped. Peoples jars are overflowing with them. I think some people have two jars of em. I want my jars to be filled with lightning bugs,ladybugs,butterflies,all things delightful & lovely to look upon. The article really helped me and couldn't have come at a better time! Ahhhhh the colors of fall-the apricot tree in the backyard has leaves that are starting to turn,and there's a slight coolness in the air. I'm also thinking more about knitting & other projects I'd like to do for All Hallows & Yule. Currently I'm working on a shrug for myself-called a "nightingale" the pattern is from the '60s. I love those older patterns for their simplicity! I'm getting a keen interest in churning my own butter and found a wonderful supplier for the supplies. Perhaps next paycheck or after the holidays (resolution for 2010-make my own butter instead of buying!) My mom had me make some using a small jar & shaking it till the cream turned into a lump of butter-the taste was wonderful-made store bought butter seem awful. In the yard,(which has been neglected except for watering-it's been scorching out here) I'll be needing another 6 pak of marigolds for my cauldron pot (I got one of those med sized plastic cauldrons,drilled holes in the bottom,and it's now my Halloween planter-marigolds look fantastic in it-very festive and the proper colors. I'll post a pic here after the new flowers get planted in it. Slipper Project from Hay Makin Issue of MJF! I've always had probs finding slipper my size (size 2 kids) without some cartoon personality on them,so when I got my 1st issue of Mary Janes Farm at my grocery store I got my knitting needles out & wheeee! made the fancier pattern (which is a cinch) A great way to use up yarn that's just sitting around,and believe me,I have a huge stash. (The bad part of going to yard/estate sales) So here's the pic of me modeling one of the slippers. (Good thing I shaved my legs that mornin! ;-) ) Left off the strap. They fit great and I'll be making more pairs & digging out vintage patterns for winter wear. Happy Labor Day,all!